Difference between revisions of "Wazamawazi"
Stations T29 and T31/C98 opened! RegioLinQ Wazamawazi metro current tracks revamped, Circle part of 51 in progress. First roads in suburbs done. First part RegioLinQ line 51 (subway) opened. New row houses in city center. Allifarki assigned as Deputy Mayor. Start on making new district: Wazumi Town. Start on making new district: Tiaga District. Start on making new district: Zwanenburg. Start on tribunal and city mall. 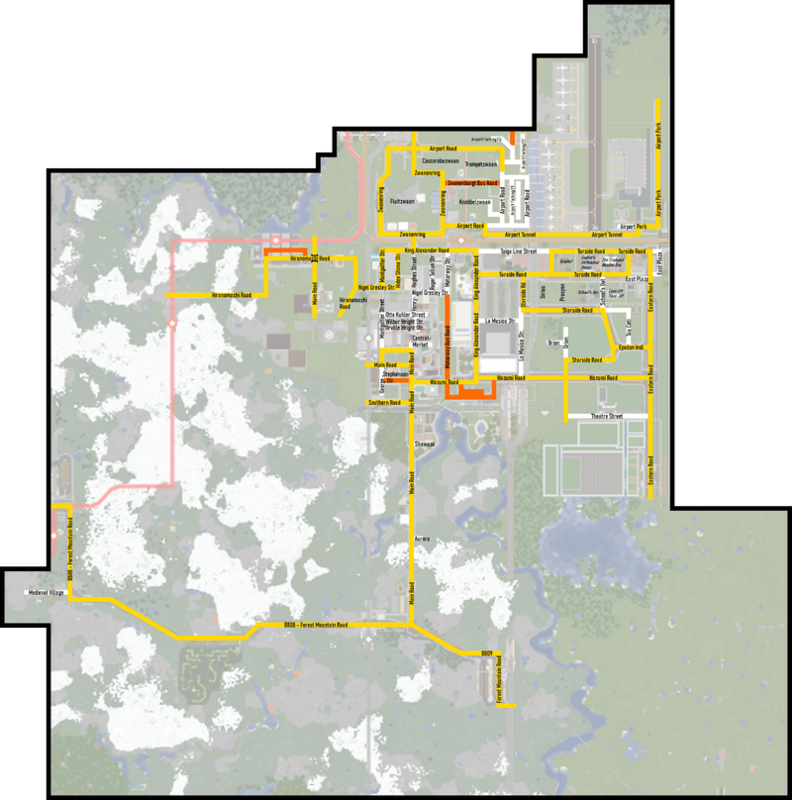 Wazamawazi has a large amount of smaller districts, and a district map will be posted soon. The area boxed in by a highway, Circle line and taiga line, mostly skyscrapers, Victorian buildings and some villa's. Includes major buildings: Town Hall, Hospital, C97 station, Gymnasium, MBS studios and Helmans bridge. The suburban area, largely filled with modern and row housing, its located north of T30. Includes major places: T30 station, T31/C98 station. A high-rise and large buildings area east of the highway, It includes mostly high rise and important buildings like: La Musica Theatre, Wazumi Mall, Queen maxima station, Doykea and more. A very small cramped district of small row housing pushed between Wazumi town and Zwanenburgt and the highway, not very popular and the only interesting thing in it is a library. A larger sized suburban area east of wazumi town pushed against the border wall of kessler. Important buildings: T29 station. M01 (Wazamawazi Motorway 01) Exits: M0101 wazumi town, M0102 Wazamawazi, M0103 wazamawazi north, M0104 Wazamawazi Hillside. The City will soon be connected up with a regional road to the A8. 2 TramLinQ Tram 2 runs from the main station via Shawazu to the Queen Maxima RaiLinQ hub and then continues into Gardenside district. 18 BusLinQ Bus 18 rides a shuttle service between tramstop City Center and Queen Maxima so people traveling from the north to Queen Maxima can save .25 cents by not traveling via the Main Station. Wazamawazi had 2 MRT station's (In the period it wasn't allowed) due to a misunderstanding between autobus22,thomasfyfe and frumple. Wazamawazi had the first highway on GAMMA that's usable. Wazamawazi had the first new world level crossing with a MRT line. Wazamawazi Is the town named with the most W's on the MRT. Wazamawazi was supposed to host the 3rd eagle awards in La Musica Theatre. This never happened as the event was postponed twice and eventually cancelled. This page was last edited on 15 April 2019, at 13:00.